Think I'll stick with he BMWP at the moment and see how much of a difference they make. Thanks for all the help. Really appreciate it. OK here we go again ... Koni Sport dampers arrived today from ebay managed to save a few quid off buying from my usual retailer (Larkspeed) as while these are pre-owned they are brand new and unfitted(seller never got around to fitting them), slightly different to last time as while fronts are identical the rears are different part number (they are for E92 coupe 3 series), reading on USA sites that what all retailers supply over there for 1series despite there being a 1series specific rear damper, strange! but apparently they work well and slightly firmer valving so we will see. Also made up my mind on springs to try next and ordered some BMWP springs, BMWP front Bumpstop and rear damper topbushes from Cotswolds today, Koni Rear bumpstop will be going on as previous just waiting on Larkspeed getting stock in. Springs wise its been difficult choice, easy/cheapest was to stay with Msport but I wanted something a little firmer, Eibach Pro-kit was next option but touch to low on front and not much firmer than stock on front either, other options were Swift Spec-R from USA which are good bit firmer rate but from what ive seen might be a touch low and also pricey for that they are, favourite was to do coilover spring conversion with HPA kit as link ( http://www.hpashop.com/Koni-Coilover-Co ... 82-e9x.htm ) but its getting on £400 shipped+tax without springs and another £200+ for some springs over here so it was starting to get out of hand, ideally I want to make my own version of this kit but finding time is going to be tricky however it is a future project, so this time its the BMWP springs which are actually for a 135i and higher rate than Eibach Pro-kit which should if maths is correct sit closer to Msport height than Eibach Pro-kit which is what im after, don't want it any lower if possible as the lower you go the less damper travel which on roads around here is not good. Parts list of what im fitting for reference. Pic below of dampers, once other parts arrive will get update but springs have to come from Germany so could be a couple of weeks. Last edited by THETYRANT on Wed Jan 17, 2018 8:01 am, edited 1 time in total. Very interested to see how you get on with this. Is there a way to make the rears more easily adjustable this time? Last edited by THETYRANT on Wed Jan 17, 2018 3:43 pm, edited 1 time in total. Watching this thread - just about to buy my first 130i and know the suspension is high on my list. 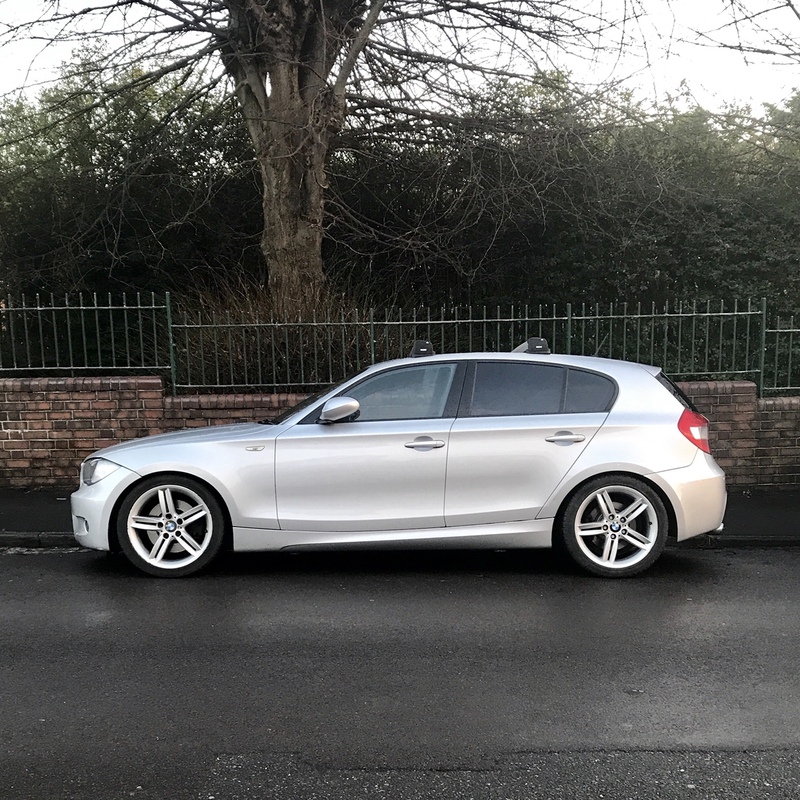 Few tweaks to the suspension makes the 130i a much nicer road car all depends what your used to and want to focus on as to which way to go, as you may or may not have read in this mammoth thread im trying to find the ultimate "all-rounder" so able to cope with everything from pottering about with family aboard giving improved comfort, solo b-road blasts and the odd trackday!..... the Koni dampers were great on last car and this time im just fine tuning/experimenting on a few things with springs, to be fair with the Eibach Pro springs last time and the shorter bumpstops it was very good and i would recommend it Will this car be better still ? we will have wait and see! Thank you for the advice the other day Ian. Just had a B12 kit fitted to my 130 today, I know it’s not your preferred option but was the best value for me given the included bump stops (and the fact I didn’t trust what came on the car etc). Seems getting a full kit was the best option as all my M-Sport dampers were totally gone, pretty much no oil in the fronts at all (had done 75k though). I’ve got a much higher ride height now, which is odd. Checked the springs that came off and they match the OE codes (D0) on the back for example. I guess the Eibachs will settle a bit with time but it’s a good 25mm higher, so no idea why it was so low before. The new ride height seems about right comparing to photos on here, got no pics right now as it’s dark, but here’s one before the new kit went on which looks lower than most. Good to hear your happy with the B12 kit, for the money its decent setup and coming with all dampers,springs and bumpstops etc a nice simple upgrade, while the ride is not too my personal tastes it certainly a good improvement in handling over the msport kit, especially a tired 10+year old setup! Interesting on the ride height, +25mm seems a bit off what ive seen but depends how low it was before, doesn't look too bad in your before picture and while rear is often a touch higher with this kit front is usually same or a tad lower (~10mm) however it will take a little while to settle in etc, can you measure from wheel centre to arch lip for reference ? Not with the car today but will measure. When I first got the car I remember measuring against the details in another posts on here and mine was lower, hence my assumption that it was on lowering springs, which it turns out it wasn’t. Was thinking last night that it’s likely that the old bump stops were totally knackered, which might have ‘lowered’ it, though I didn’t think an unloaded car should be sat on the bumps. Yes the factory msport setup is sat on bumpstops at rest, all be it only just in an unladen car if everything else (damper/springs etc) are in good shape, on these cars like many now (my GT86 was the same) are very bumpstop active and use it as an additional damper and spring with soft coil springs/damping to try and get the balance of comfort and handling, i would like to drive a brand new 130i next to 10 year old one to see how it compares as the bumpstops degrade quite quickly being just foam compare, i know on my 1st 130i which was only a couple of years old i thought it rode pretty well at first. B12 kit on the rear at least gives more free damper travel before bumpstop contact which along with the firmer spring helps prop up rear of car better, it was seeing this that got me thinking i could fit shorter bumpstops to stock or Koni dampers etc, which softens ride nicely but does affect turn in/stablty unless rear spring is upgraded to something like the Eibach, Front of the B12 kit has an internal bumpstop due to inverted damper and uses it all the time much like the factory setup as additional damper/spring, that is what give it the firm feelling i dont like but at least with better damping its more controlled at speed, i believe the Birds B1 kit has a shorter or different internal bumpstop which is what makes it softer ride, i still felt it was firm though at lower speeds. I would really like to see a damper dyno test on both an off the shelf B8 damper (as used in B12 kit) and the Birds B1 damper as well as removing bumpstops to compare those, a lot of work though and disassembling inverted dampers like thise to remove bump stops can damage the dampers so probably never happen. Good knowledge and that all makes sense with the B12 feel. I’m now pretty convinced that my old front bump stops were non existent - I could bounce the front of the car up and down by a good few inches, so they must have sagged a lot when in the car. That likely made the ride height much lower when driving. Perhaps I should have taken your Koni route and may do one day if I’ve the funds but the B12 was the best use of funds at this time. 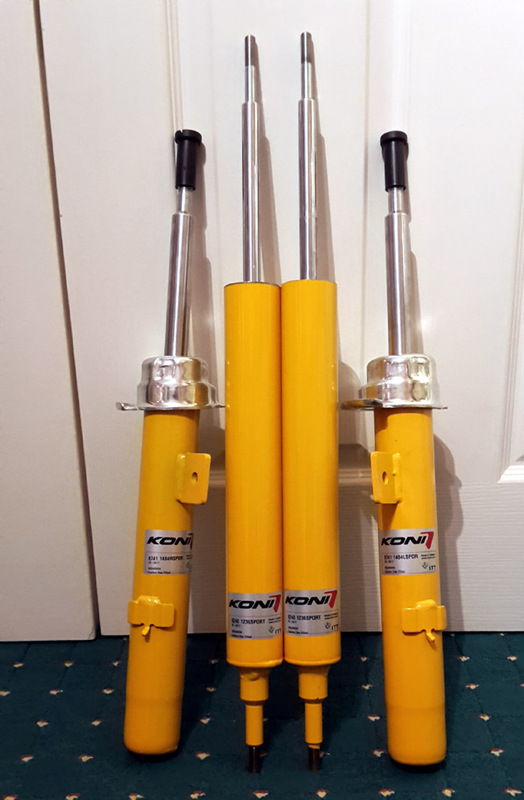 More parts arrived with some Koni rear Bumpstops from a member on here who didnt need them, also the BMWP Springs along BMWP Front bumpstops and rear damper top mountings from Cotswolds have just landed, think i have everything now to get it all fitted just need to find time! That’s what I am after. For the short term would fitting the shorter Koni rear bump-stops smooth the rear ride out? If so, are there any negatives to this mod? I do not want to find the car sits any lower than it currently is. Everything feels nice and tight suspension wise so my main goals is to reduce the rear jiggle. I would say 1st step is to work on rear bumpstops, there are a few options depending how you use your car and how much comfort is a factor, maximum comfort is to either fit the Koni bumpstops or shorten your own (not easy to do well due to shape, but is possible to improve and retain progressive nature), this gives you much more free damper travel (~50%/35mm or so) which stops the rear pogo/jiggle stock car has, downside is the car is not as well supported at the rear as by doing this you have reduced the rear spring rate, in my experience it shouldn't sit any lower at least when unladen or lightly loaded (1-2 people) as coil spring is still enough to hold car up but it will squat more under acceleration and cornering, I have no issue with this and my car is currently just on shorter rear bumpstop no other damper/spring mods and it rides much better than stock and handles well enough for me, best thing is if you do this mod and don't like it then easy to reverse refit stock parts no harm done. If you want the rear better supported for using heavy loads and keep handling as close to stock you can fit BMWP rear bumpstops, these are inbetween stock msport and Koni for length and allow around 11mm more of free damper travel which does help somewhat with comfort. My current plan is that when i change dampers to replace the shortened stock rear bumpstops (which I did as a temporary/interim fix) with the Koni ones, then also fit stiffer BMWP springs to help firm up rear of car, I had good success with this last time using Eibach Pro springs and only reason Im using BMWP this time is they are slightly firmer again on rear and also on front which shouldn't allow it to drop so much. Once you get rear behaving as you want you can work on front, its not a simple on this end but in other ways it is! you cant just fit a really short bumpstop due to very soft coil spring and you need coil sping and bumpstop to work in harmony unless changing to new coilovers etc, ive found fitting an uprated and slightly shorter BMWP front bumpstop works well especially if yours is tired and split, even just new stock msport would improve things. Thanks for the info Ian. Do you know the part number of the BMWP rear bump stops? BMW parts had no idea what I was in about.